Distribution area: Found throughout Thailand. The snakes are often found in termite hills and also in flower pots and other damp and dark areas. They eat termite eggs. Habitat/behaviour: The snake lives exclusively underground and is generally only found when earth is disturbed or when clearing rotting wood and such. The example illustrated here has a length of 8 cm with a thickness of 1 mm. Due to its small size and underground way of life, Ramphotyphlops braminus is somewhat cosmopolitan, as it is frequently exported with plant supplies into other countries. It is now found in nearly all tropical and subtropical countries. 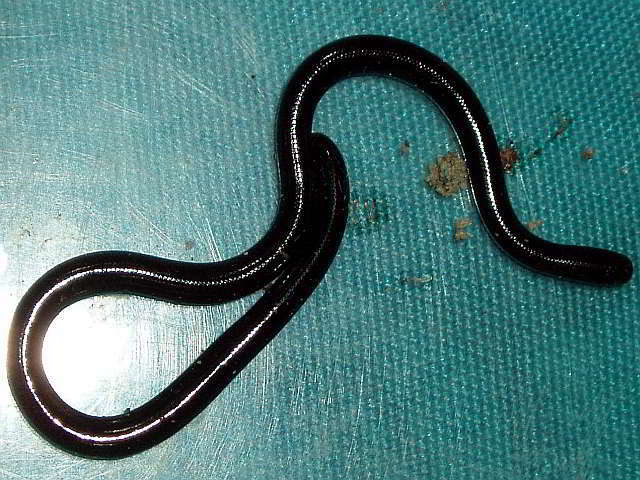 As superstition is widespread in Thailand, the Brahminy blind snake is dried and kept in a box with a money note, which allegedly brings financial prosperity. Due to the lack of exact knowledge about the appearance of Ramphotyphlops braminus, earthworms are frequently dried and used as they are erroneously regarded as worm snakes. In captivity, Ramphotyphlops braminus has been bred in Japan in a laboratory. Ramphotyphlops braminus multiplies through parthenogenesis, which means that since only female animals exist, the eggs develop without male sperm. The 2 to 7 eggs, which are the size of a grain of rice, are laid in June. Length: Most kinds are only around 20 cm long. The „larger“ types such as Typhlops muelleri reach a length in excess of 40cm. Distribution area: Typhlops is found everywhere in Thailand, however not all kind in all provinces. Behaviour/habitat: The Typhlops species is a small snake which lives at ground level and which usually reside under leaves and rotting wood. Danger level: They look similar to the illustrated Ramphotyphlos braminus. These snakes are completely harmless.